Everyone has an aim in life. The most important one, from the point of view of every person, is definitely not related to finances (or at least should not be), but if we focus on this one category, there is no doubt the most important goal is... retirement. And I do not mean by this what we get after reaching a certain age from the ZUS (Polish Social Insurance Institution), or in fact from the state, as ZUS has no real money. ZUS disposes only of what the present employees will pay in the form of various contributions, and the rest is supplemented by the state budget. For years, the media have indicated that with the current demographic processes, the present-day thirty-year-olds will get starvation-level pensions. All this will be caused by the fact, that the number of employees will gradually decrease, and the number of pensioners – increase. Ever more often, the subject of providing only the so-called basic pension recurs – the pension which will be enough to survive, in the best-case scenario. We cannot count on the OFE (Polish Open Pension Funds) either, as it will most probably be dissolved, if not now, then in a few years at the latest. Hence, the future is not particularly bright. That is why you need to face the truth, the quicker the better. If you want to lead a dignified life once you retire, or even retire earlier than it is expected by the legislator, you need to take care of it yourself. And this is naturally connected with saving and investing. I will not discuss here the ways of saving or investing, it is a subject for a separate article. However, it is important to realize how time influences our savings and why it is worth considering even at the age of 20. The power of compound interest . What is compound interest? To put it simply, it is an assumption that interests accumulated within a particular period of investing are added to the next term and therefore increase the savings’ base. Thus, savings grow ever faster (exponentially). This will be best illustrated on an example. The compound interest allowed me to save three times more. Let’s assume that I am a 20-year-old man who will retire in 45 years, at the age of 65. I am able to save PLN 200 monthly and I cautiously assess the profit on my investment at about 3% per annum. Under these conditions, in the next 45 years I will collect almost PLN 196 060. If I do not invest, but I keep money “under the mattress” instead, I would have only PLN 108 000. The compound interest allowed me to save two times more. Therefore, it is useful to start saving as soon as possible. 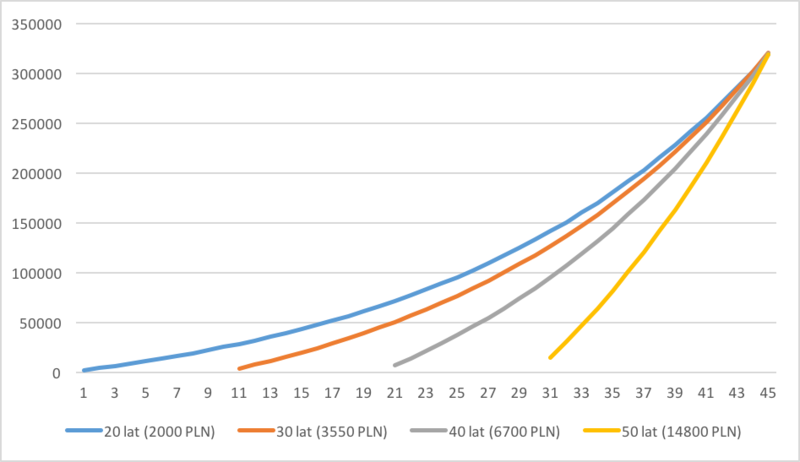 At the age of 30, in order to collect the mentioned PLN 196 000 under similar assumptions (the annual profit of 3 %), I would need to save about PLN 296 every year, and not PLN 200. When I turn 40, this amount will already grow to PLN 452 monthly. If you start thinking about retirement at the age of 50, in order to reach PLN 196,000, you would need to start with PLN 856 per month. The graph below perfectly presents this problem. The aim is the same, but a 20-year-old will need to start with PLN 90,000 to achieve it, a 30-year-old should find over 34,000 more, a 40-year-old will invest PLN 167,500 in total, and a 50-year-old as much as PLN 222,000. I think everyone is able to assess which way is the easiest to implement. The problem is that when we are young, we are concerned with other issues than retirement. We prefer to spend money on entertainment, a new smartphone, or a new car, and not on a distant aim, which at the age of 20 seems to be cosmic. The above example shows, however, that even PLN 100 saved at such an early age can translate into many thousands of profit in 40 years. Another question is whether the PLN 196,000 is a sufficient amount for the retirement period. However, no matter what the answer is, it is better to have this sum than not.